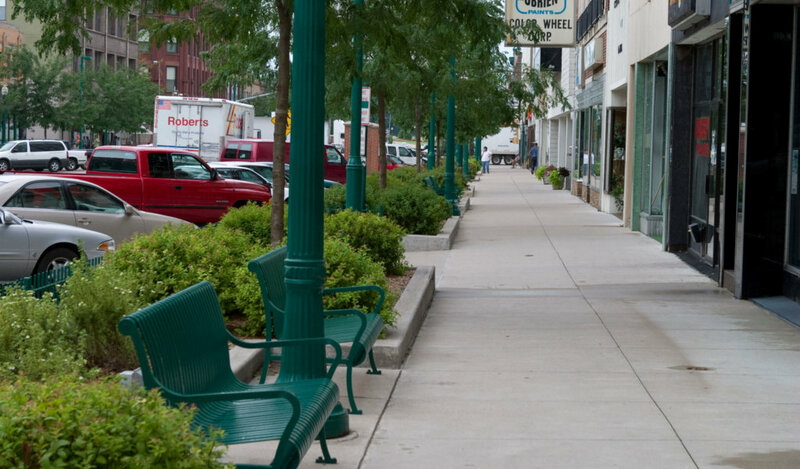 Seating areas and other streetscape amenities are an important placemaking component that encourages visitors to explore local shops. A two foot difference in elevation between the street and business entrances was transformed to provide a unique sense of place with elevated planting beds. Steps and ADA compliant ramps ensure access for users of all abilities. Brick accents help reinforce a consistent theme throughout the streetscape. Large columns draw attention to pedestrian crossings and help calm traffic to improve safety. 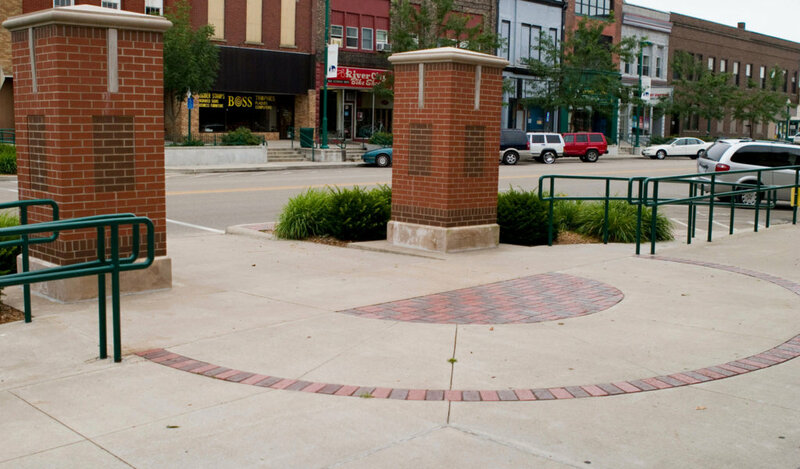 Creative placemaking and local history combined to revitalize downtown Clinton, Iowa on this three-block streetscape project. 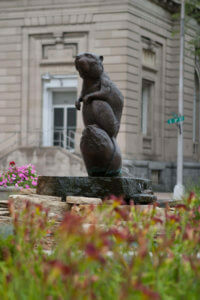 Sculptures of local wildlife provide a strong tie to Clinton’s natural surroundings while establishing a streetscape theme. Extending through the oldest part of town and ending at the Mississippi River, this project was completed in two phases to minimize construction-related impacts to local businesses. A large elevation change of approximately two feet between street and business levels posed a significant project challenge. Through strategic design and application of placemaking principals, the design team capitalized on the change in elevation by incorporating steps and ADA-compliant ramps that strengthen multimodal accessibility. Trees, native planting beds, and seating areas were also integrated with the change in elevation in a way that enhances the pedestrian experience and creates a sense of place. 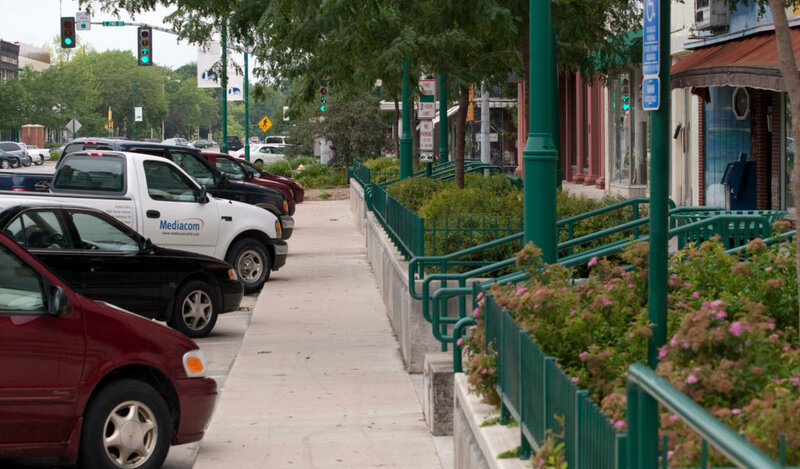 Similar to the Winterset Streetscape, a significant number of underground vaults, which once provided access for business deliveries, were filled in and reinforced to strengthen the structural integrity of the sidewalk. To better accommodate active transportation users, mid-block pedestrian crossing areas anchored by four large, brick columns were included with the project. The use of these large, vertical elements helps calm traffic and separate pedestrian zones for improved safety. Working with a commissioned artist, decorative corner water fountains, native wildlife sculptures, and interpretive plaques were installed to provide a unique aesthetic appeal inspired by local history and the natural environment. Provoking conversational elements and functioning as landmarks for wayfinding. A mix of concrete and brick sidewalks, decorative street lighting, rails, and fencing provide the finishing touch on this streetscape revitalization. The presence of these elements provide for an alert to visitors that they have arrived within the public space. During public engagement, it was determined that the project should provide a design connection to the Mississippi and instill a sense of history. Significant planning with the city, local business owners, a steering committee, and other stakeholders helped ensure that vision that was brought to life. Planning, construction documents, and cost opinions were among the services provided by Snyder & Associates.